For today’s blog post I want to tell you about the new products from Teva that we are now proud to be carrying here at Everything Summer Camp. Check out Teva’s sweet summer and sports sandals: the Omnium in kid’s sizes, the Omnium for women, and the very stylish, kid’s sandals they call Barracudas. Before we go into these products, let me give you a quick breakdown of the technology Teva uses in their certain pieces of footwear. Their Durabrasion Rubber outsole delivers absolute balance, performance and durability. Their Shoc Pad technology keeps a bumpy trail feeling smooth under your feet. Lastly, their Spider Original technology allows you to scale a wet rock with the efficiency of our arachnid friends! Okay, now let’s take a look at the kid’s Omnium. These innovative sandals offer nearly as much foot coverage as a regular tennis shoe would. This offers full protection for your kids’ feet; however, the sandals sneak in a lot of holes which make it sort of the Swiss cheese of summer sandals. Besides maximum comfort, this sandal offers an extremely grippy Durabrasion Rubber outsole as well as a very comfy EVA midsole. Onto the Women’s Omnium Sport Sandal, these versatile sport sandals are great for any summer camp adventure! Especially great for water activities like canoeing or hiking in a rainstorm, this shoe is given Spider Rubber and its materials are all quick to dry in order for your feet to remain comfortable. 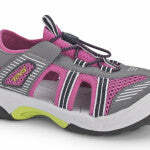 Like the Kid’s Omnium, this sport sandal for women provides you with absolute comfort and protection. Enjoy. Back to the kid’s sandals, find the Barracudas at Everything Summer Camp. These sandals are cool, waterproof, and just about unbreakable! A very simple design, Barracudas are quite lightweight and very easy on your feet. 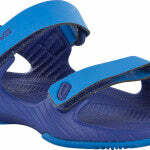 Finished with Durabrasion Rubber outsole for grip, these sandals are probably most convenient for camp. So grab some Teva sandals for your summer camp experience! Until next time, Camp Fans!